The Lost Canyon trail is located in the Needles District of Canyonlands National Park in eastern Utah. 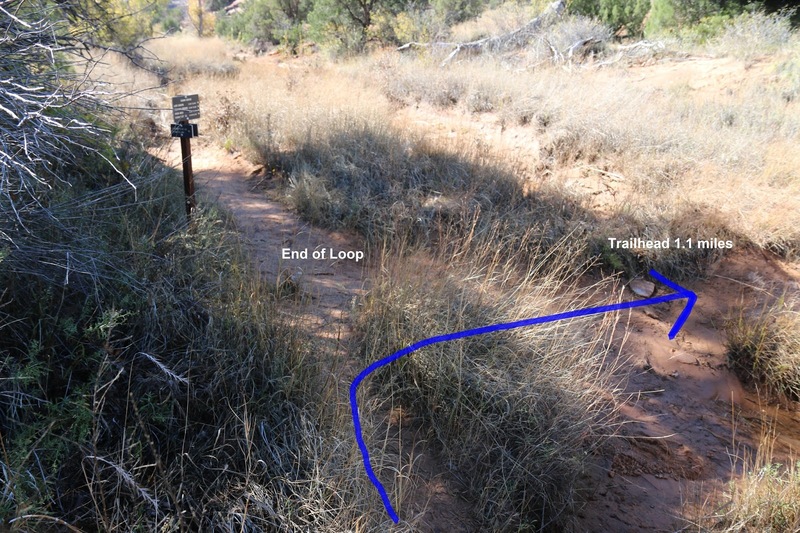 The trail is normally combined with a portion of the Squaw Canyon trail to form an 8.7 mile loop. With three backcountry campsites in Lost Canyon and a couple more in Squaw Canyon there is the opportunity for backpackers to enjoy a multi day excursion. Anyone that is planning to spend the night in the backcountry of the Needles District must first obtain a free permit at the Visitor Center. 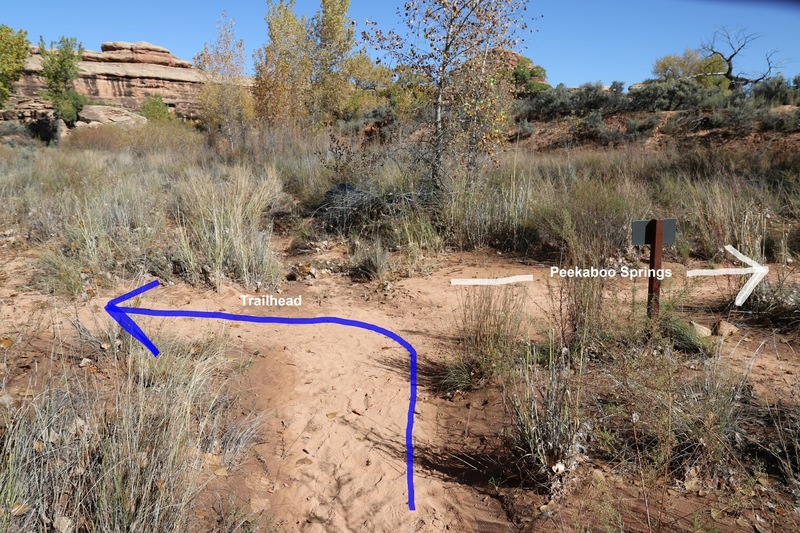 Water tends to be available year round in the streams and seeps of both canyons creating a riparian environment in an otherwise parched desert landscape. To get to the Needles District of Canyonlands National Park drive south out of Moab on Highway 191 for 40 miles, or north out of Monticello for 14 miles, turn west onto Utah 121 and follow the paved road for 35 miles. The Squaw Flat trailhead is several miles further into the park in Loop A of the campground. Parking is limited at the trailhead so arrive early to get a spot. If the lot is full you might be able to find a place to park at the trailhead in Loop B where you can hike the connecting trail, that is a little over a quarter of a mile, to the Loop A trailhead. The trail forks a short distance from the trailhead where the Big Springs Canyon trail branches off on the right. After that first fork the trail crosses some easy hiking flats and then climbs up and over several sandstone hills that are interspersed with more easy hiking. From the tops of the hills you can catch some fantastic views of a few of the cliffs and spires that iconify the Needles District. 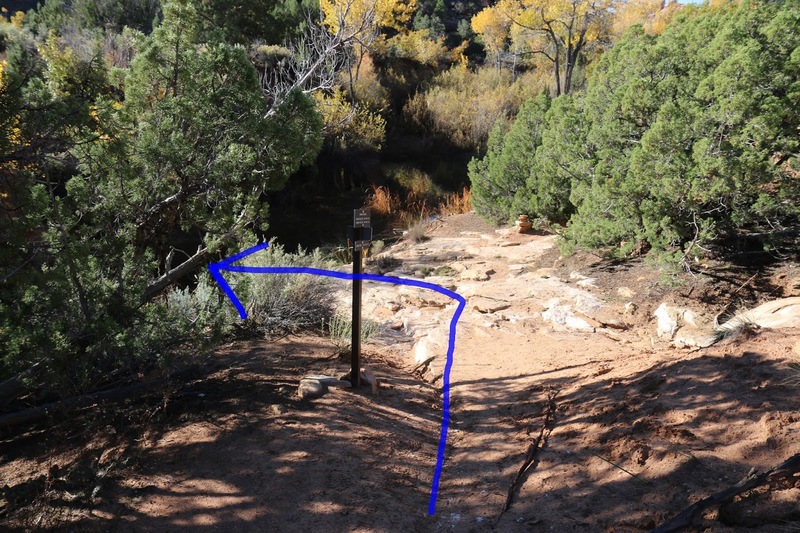 The next fork comes up at the 1.1 mile point where the Lost Canyon trail branches off on the left and the Squaw Canyon trail continues to the right. Most hikers and backpackers take the left fork at this junction and hike through Lost Canyon from the bottom and return by the Squaw Canyon trail. For this post we are going to hike in the opposite direction in order to avoid having the morning sun shining directly into our camera lens. 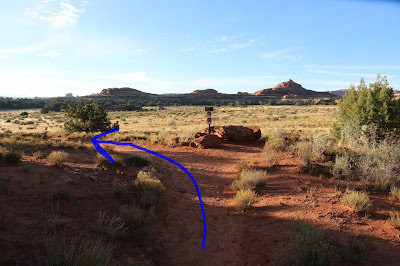 One bonus for hiking in this direction is that we will be scooting down the challenging section of slickrock where the the trail crosses the ridge into the lower end of Lost Canyon rather than scrambling up it. We have gone both directions though and don't really favor one over the other. Hiking up Squaw Canyon is a very pleasant experience. Except for a few small hills and a couple of creek crossings the trail is a very easy stroll. The trail continues up Squaw Canyon for another 1.8 miles where at the 2.9 mile point from the trailhead the upper end of the Lost Canyon trail branches off on the left. As the upper end of the Lost Canyon trail departs from Squaw Canyon it crosses the stream once more. As the trail comes up out of the streambed it bends its way through the brush where a short spur trail to the second Squaw Canyon backcountry campsite branches off on the right. From there the trail begins a fun climb up a cascading slickrock trough that serves as a convenient mountain pass to higher ground. 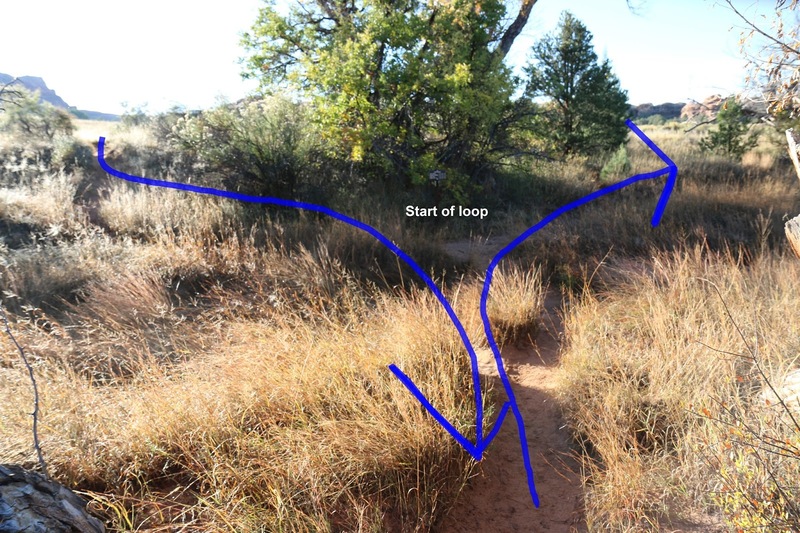 The scenic views explode at the top of the trough where the trail follows a cairned route over easy slickrock toward a saddle in the ridge where it passes into the upper end of Lost Canyon. The scenic views continue to be outstanding from the gap in the ridge. No matter in which direction you gaze your senses will be enlivened as you enjoy the fruits of your labors in reaching this point of the hike. While elevation wise this might be the highest point of the hike it is by no means the end of the scenic views as there are several more courses upon which to feast. You might even consider the entire hike to be an endless buffet where one treat after another awaits your discovery. From the saddle in the ridge the trail courses around the slickrock bowl where it reaches the edge of the cliff above the canyon. From here the trail follows a natural course that drops down a series of ledges until it reaches the canyon below. For those that are hiking in the other direction there are several foot holds drilled into the rock in convenient places to make the climb a bit easier. Going in this direction the ledges are easy enough to either walk or scoot down with a little care of course. A series of stone slabs have been places to form a staircase down the last section of trail into the canyon making easy work of what would otherwise be a slippery slope of scree and talus. The upper end of Lost Canyon is narrow and easy to navigate. As the canyon broadens it becomes choked with a thick growth of trees, willows and other brush. Flash floods, which occur frequently in the summer months, tend to wash out the trail in places making route finding a little more difficult. It is hard to get lost though as long as you stay in the main canyon which is obvious enough. If you find yourself fighting your way through a lot of brush then you have probably strayed from the main trail. A little backtracking might be needed to get back onto the main route. The backcountry campsites in Lost Canyon are among the best in the Needles District for peace and quiet and access to filterable water. Backpackers have mentioned to us that they are particularly fond of LC2 and LC3. Around the 6.5 mile point the trail reaches its intersection with the Peekaboo Springs trail. If you are hiking the loop in the opposite direction this is the 2.6 mile point of the hike. The Park Rangers send quite a few hikers to Lost Canyon that are looking for a short hike where they can get a good taste of the Needles District's backcountry. This is the spot where they typically turnaround and head back to the trailhead. From the Peekaboo Springs junction the trail continues down Lost Canyon a bit further to where a cairned route makes a scramble up the slickrock to a narrow bench. The trail follows the narrow bench around the rim of the canyon. The photo above is of the narrowest section of the trail. It is safe enough when it is dry but use a lot of caution during wet or icy conditions. 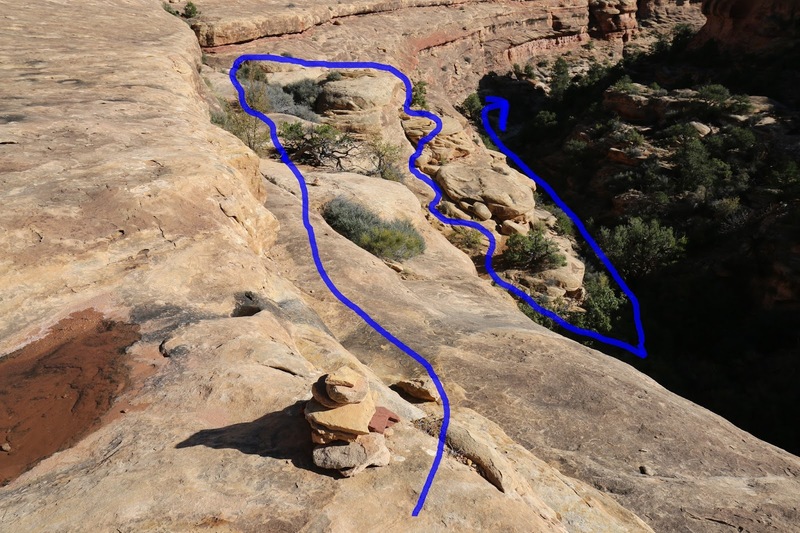 A short ladder transitions the trail from the narrow bench to the broad slickrock at the next level up. From the top of the ladder the trail routes around the cirque above Lost Canyon where it crosses a saddle in the ridge that separates it from the Squaw Flat area. The trail comes to a section of challenging slickrock after popping over the ridge. The challenging part is only about 8 feet long and going in this direction all you have to do is scoot down it on your seat. We have seen people with good traction simply walk up and down it so for the well equipped with a good set of knees it is just another bump in the trail. The picture probably makes it look more hazardous than it really is. It isn't like a cliff that you need to worry about falling off of but more like a rounded dome of rock where you slide down a short section to the boulder, wedge past the boulder to another short slope that has good footing and then scramble down a 3 or 4 foot spot where you are once again on your way. Once over the ridge and down the slickrock it is less than a mile of moderate to easy hiking to the point where the loop began. From there the remaining 1.1 miles back to the trailhead should all be familiar ground. The trails in the Needles District tend to be well marked with cairns where the routes travel over rock and signs at each of the trail junctions that indicate how far it is to the next junction or point of interest. There are a lot of interconnecting routes though and it is best to always take a map along. 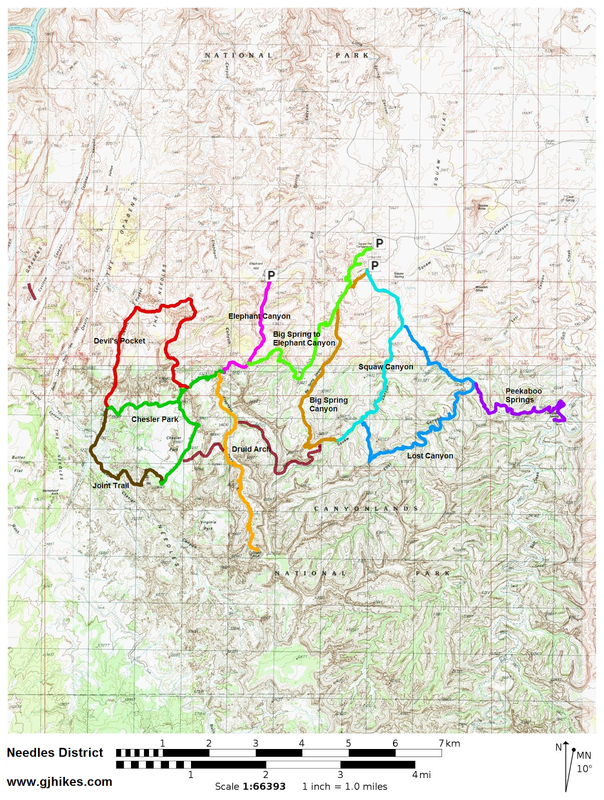 We recommend printing out a copy from the Park's website and if you want a map with topo lines you can print the one to the right and take it also. 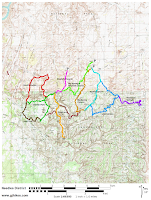 If you are a serious hiker with a GPS you can also download our GPX file and preload it onto your device before setting out. As far as Lost Canyon goes, if you would like to see it for yourself then all you have to do is 'Take a hike'.